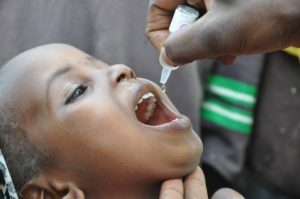 Oral poliovirus vaccines (OPV) are the predominant vaccine used in the fight to eradicate polio. There are different types of oral poliovirus vaccine, which may contain one, a combination of two, or all three different serotypes of attenuated vaccine. Each has their own advantages and disadvantages over the others. The attenuated poliovirus(es) contained in OPV are able to replicate effectively in the intestine, but around 10,000 times less able to enter the central nervous system than the wild virus. This enables individuals to mount an immune response against the virus. Virtually all countries which have eradicated polio used OPV to interrupt person to person transmission of the virus. OPVs are all inexpensive (US $0.12-$0.18 for countries procuring through UNICEF in 2016). OPVs are safe and effective and offer long lasting protection against the serotype(s) which they target. OPV stimulates good mucosal immunity, which is why it is so effective at interrupting transmission of the virus. OPVs are administered orally and do not require health professionals or sterile needle syringes. As such, OPVs are easy to administer in mass vaccination campaigns. For several weeks after vaccination the vaccine virus replicates in the intestine, is excreted and can be spread to others in close contact. This means that in areas with poor hygiene and sanitation, immunization with OPV can result in ‘passive’ immunization of people who have not been vaccinated. OPV is extremely safe and effective. However, in extremely rare cases (at a rate of approximately 2 to 4 events per 1 million births ) the live attenuated vaccine-virus in OPV can cause paralysis. In some cases, it is believed that this may be triggered by an immunodeficiency. The extremely low risk of vaccine-associated paralytic poliomyelitis (VAPP) is well accepted by most public health programmes. Very rarely, when there is insufficient coverage in a community the vaccine-virus may be able to circulate, mutate and, over the course of 12 to 18 months, reacquire neurovirulence. This is known as a circulating vaccine-derived poliovirus. Prior to the development of tOPV, monovalent OPVs (mOPVs) were developed in the early 1950s, but largely dropped out of use upon the adoption of tOPV. It was not available at the time of the founding of GPEI in 1988. Monovalent oral polio vaccines confer immunity to just one of the three serotypes of OPV. They are more successful in conferring immunity to the serotype targeted than tOPV, but do not provide protection to the other two types. Monovalent OPVs for type 1 (mOPV1) and type 3 (mOPV3) poliovirus were licensed again in 2005, thanks to successful action taken by the GPEI. They elicit the best immune response against the serotype they target of all the vaccines. Monovalent OPV type 2 (mOPV2) has been stockpiled in the event of a cVDPV2 outbreak. Following April 2016, the trivalent oral poliovirus vaccine was replaced with the bivalent oral poliovirus vaccine (bOPV) in routine immunization around the world. Bivalent OPV contains only attenuated virus of serotypes 1 and 3, in the same number as in the trivalent vaccine. Bivalent OPV elicits a better immune response against poliovirus types 1 and 3 than trivalent OPV, but does not give immunity against serotype 2. As well as in routine immunization, bOPV will be used for outbreak response against poliovirus types 1 and 3 outbreaks. Prior to April 2016, the trivalent oral poliovirus vaccine (tOPV) was the predominant vaccine used for routine immunization against poliovirus. Developed in the 1950s by Albert Sabin, tOPV consists of a mixture of live, attenuated polioviruses of all three serotypes. Also called the ‘Sabin vaccine’, tOPV is inexpensive and effective, and offers long lasting protection to all three serotypes of poliovirus. The trivalent vaccine was withdrawn in April 2016 and replaced with the bivalent oral poliovirus vaccine (bOPV), which contains only attenuated virus of types 1 and 3. This is because continued use of tOPV threatened to continue seeding new type 2 circulating vaccine-derived polioviruses (cVDPV2), despite the wild type 2 virus being eradicated in 1999. 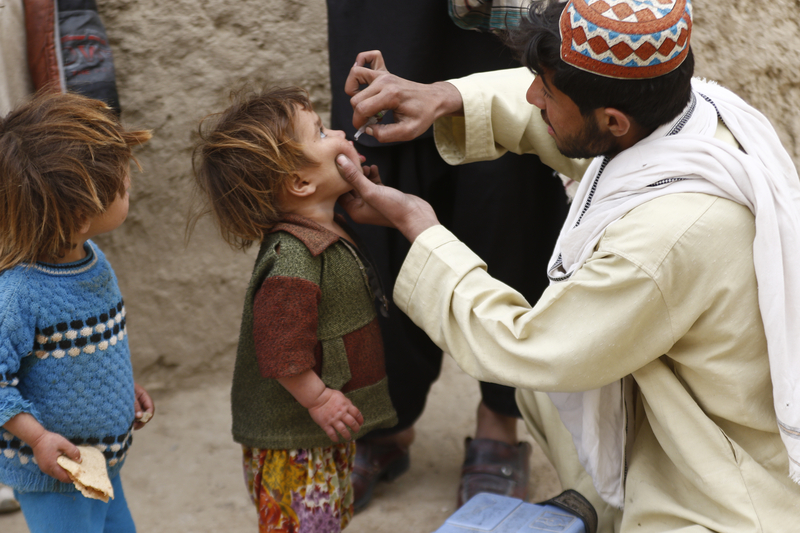 This rate is expected to significantly decline, as the type 2 component of oral polio vaccine was removed from routine immunization worldwide in April 2016; this type was responsible for approximately 40% of all VAPP cases.